I absolutely LOVE Christmas shopping. I do it all year long, and love keeping my eye out for little things that will make my family happy. One of my very favorite parts of Christmas morning has always been the stocking. Growing up, we took turns opening one present at a time from our stocking….carefully watching each other enjoy the little gifts inside. Now, I continue the tradition with my own family, each taking turns, and really stopping to enjoy each little gift inside. 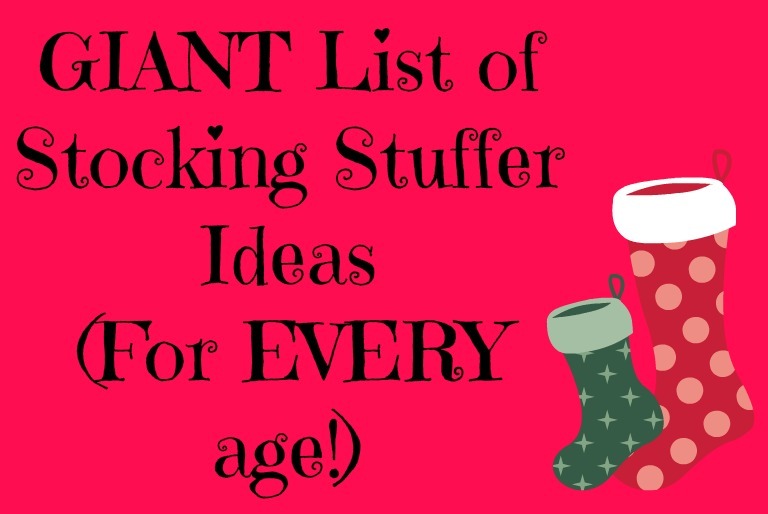 I have a blast coming up with things to stuff inside our stockings, and wanted to share some ideas with all of you. I hope you will find this list helpful, and that you come away with at least one or two new ideas to make someone in your life smile this year.I will break down the lists by category so you can just search through the lists you need! This is a tough category for many people. We want our younger children to be included (and to teach our older children that the younger children are as equally important), but it is often hard to come up with ideas for a person who can’t have treats, will choke on just about everything, and who honestly….doesn’t really know what’s going on. Still, I will be including my one year old in the stockings this year (of course! ), so here is a list for the babies in your life. passes to local bowling alley/amusement park/putt putt golf/etc. scentsy bricks or other jar candles/votives/etc. Coupons for babysitting, a day off, an offer to cook dinner, clean up the dishes, etc. Guys are often the hardest to shop for….especially if your man isn’t into any specific hobby (or if they’re like mine and have expensive hobbies!) However, I hope this list helps! Hope this helps! Have fun shopping for the little gifts this year! May your stockings be filled with fun, happiness, and love this year!! The jam/jelly & homemade fresh bread loaf is genius! Why didn’t I think of that?